photo by Jamie L. Manser/JamieManser.com. 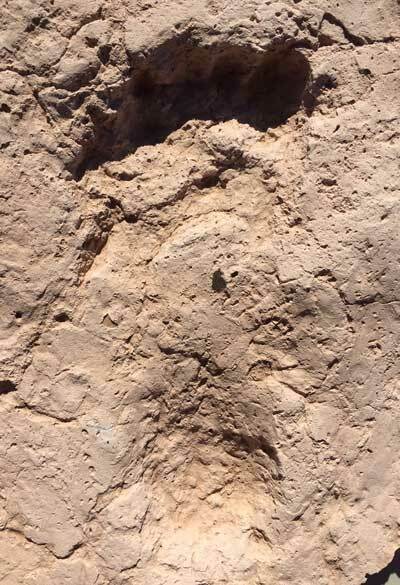 Prehistoric footprints of ancient people including a child and a domesticated canine were recently uncovered in an irrigated field excavated in Tucson, Arizona. 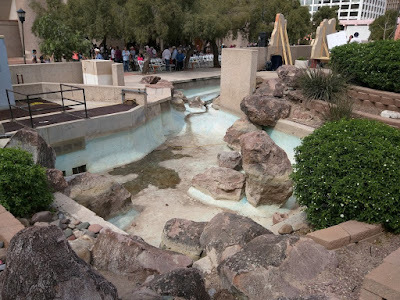 Just as incredible are the remains of their irrigation system (dating back 2500-3000 years) with two field cells and parallel channels to redirect water from the Rillito River. 4000 years ago, the first people settled in Tucson for the abundant river water that flowed year round. The Hokokam captured rainwater with rock dams. 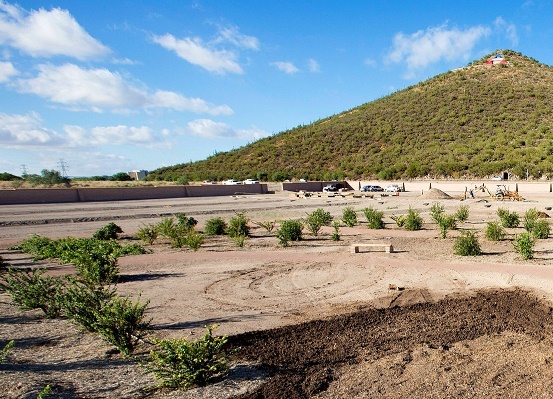 The Tohono O'odham crafted earthen dams and brush weirs to divert water from washes for crops. They lived in harmony with the desert, gathering its fruits in the proper seasons. They were experts on desert farming, having developed sophisticated techniques to grow sturdy native plants like the three sisters: beans, maize, and squash. Happily, the Tohono O’odham have brought back those traditional techniques by growing heritage crops at the San Xavier coop and by assisting with The Mission Garden at the base of “A” mountain. There is much we can learn from them about sustainability and how things grow in the desert dirt. In my last blog, I commented on how some people see only dirt when they look at our desert, but it is actually brimming with life. That got me musing about it. 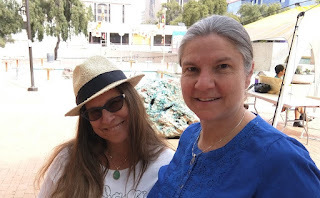 Imagine my delight in watching my friend Elaine Romero’s play, “Dirt!” Her play beautifully elaborated on that theme by including Tucson’s first settlers and the lost barrio. Her lyrical descriptions conjured up the following images for me. After the Native Americans, came the Mexicans who built Tucson. Like the mesquite, their roots were deeply embedded in the dirt. Their homes and neighborhoods were built out of dirt and water. Their roads or calle were formed by paths worn in the dirt for generations - paths that connected family and friends in their tight knit barrio community. But their footprints have long been covered over with cement in the name of progress. Out of the cement grew a big, ugly, lonely concrete monument to both urban renewal and their once vibrant community – the Tucson Convention Center. Dry fountains lined with misplaced boulders are sad reminders of our dry river beds (another causality of progress.) Nothing could grow out of the layers of concrete. Until… Borderlands Theater reclaimed the dirt under that cement with “Barrio Stories.” The descendants of the neighborhood returned to La Calle to retrace the steps of their displaced ancestors. The company was looking for a way to get Tucson’s Mexican-Americans to come back to the theater. They came up with the idea of doing a play that the whole community could get involved in. Inspired by the book, “La Calle: Spatial Conflicts and Urban Renewal in a Southwest City,” by Lydia Otero, they gathered oral histories of the people who had memories of Barrio Viejo before the devastating demolition. Playwrights Virginia Grise, Martin Zimmerman and Elaine Romero were tasked with adapting it into theatrical pieces. 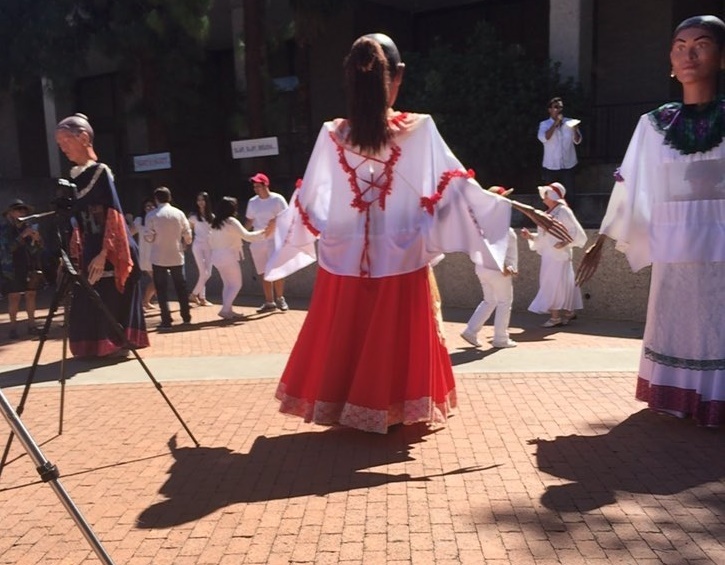 When Borderlands producing director Mark David Pinate visited the Tucson Convention Center, he knew he could put his theater education into practice by staging the plays throughout the grounds as a site specific work. Dispersed around that area were vignettes of life in the old barrio. Appropriately placed by the dried up, cement fountain was Elaine Romero’s short play, “Dirt”. 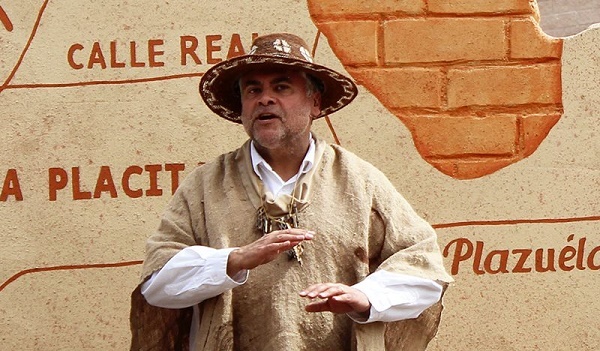 If you missed the Borderland Theater’s “Barrio Stories,” it is my honor to share this patch of “Dirt” with you. DIRT: First, there was me, Dirt, the dirt and the cactus, and the geckos, and the Saguaro, and the locals didn’t bother naming their paths, their streets. Pottery shards at the foot of “A” Mountain, Sentinel Peak, and the Tumamoc Hill date back 4,000 years before any of this mierda started. Before the cement came and laid itself on top of me and tried to make me inconsequential. First, we looked like nothing fancy. Some adobe bricks. Maybe you know what I’m talking about. Buildings made from the earth, from the ground. And it included everybody. The Hohokam, the Tohono O’odham, and the Mexican Period. I remember the day when the demolition crews came. They took something and they turned it into nothing. Some people say it looked like the surface of the moon, or an atomic bomb had come and hit downtown Tucson. And even when they finished, the people didn’t want to walk there. The people didn’t want to go there. The people felt a big hurt, a big hole, in their hearts. Bigger than anyone ever imagined. And sometimes when you’re the dirt, you have the privilege of capturing the people’s tears in your earth. I’ve had that privilege here in Tucson. Throughout our history people have left footprints in the dirt. There is much they can teach us about living in harmony with the earth and water. We can learn from our city's mistakes on urban renewal and bad water management - and not repeat them. “Barrio Stories” was more than oral histories or bearing witness to a close knit community torn apart. This was a joyous celebration of a community kicking up some dust and reclaiming the ground that was Barrio Viejo. "The recently discovered footprints owe their existence to a unique set of circumstances, Denoyer says. Soon after they were made, flooding from a nearby river deposited a layer of micaceous sand 10 to 20 centimeters deep across the field. When the field was reused, the sand-filled prints were so well preserved that it was possible to see where mud squeezed into the small spaces between their individual toes—or in the case of the dog, between claws." What? Spring already? Time to plant!